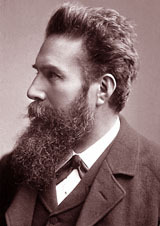 Wilhelm Conrad Röntgen was born on March 27, 1845, at Lennep in the Lower Rhine Province of Germany. He was the only child of a merchant in, and manufacturer of, cloth. When he was three years old, his family moved to Apeldoorn in The Netherlands, where he went to the Institute of Martinus Herman van Doorn, a boarding school. In 1862 he entered a technical school at Utrecht, from which he was unfairly expelled, having been wrongly accused of producing a caricature of one of the teachers. He then entered the University of Utrecht in 1865 to study physics but did not have the credentials required for a regular student, so took and passed the examination for the Polytechnic at Zurich where he studied mechanical engineering. He attended lectures given by Clausius and also worked in the Kundt's laboratory, both Kundt and Clausius having great influence on his development. In 1869 he was awarded a PhD at the University of Zurich, was appointed assistant to Kundt and went with him to Würzburg that year, and to Strasbourg three years. In 1874 he qualified as Lecturer at Strasbourg University and in 1875 he was appointed Professor in the Academy of Agriculture at Hohenheim in Wurtemberg. In 1876 he returned to Strasbourg as Professor of Physics, but three years later he accepted the invitation to the Chair of Physics in the University of Giessen. After having declined invitations to similar positions in the Universities of Jena (1886) and Utrecht (1888), he accepted it from the University of Würzburg (1888), where he succeeded Kohlrausch and found among his colleagues Helmholtz and Lorenz. In 1899 he declined the Chair of Physics in the University of Leipzig, but in 1900 he accepted it in the University of Munich, by special request of the Bavarian government, as successor of E. Lommel. Here he remained for the rest of his life, although he was offered, but declined, the Presidency of the Physikalisch-Technische Reichsanstalt at Berlin and the Chair of Physics of the Berlin Academy. Röntgen's first work, published in 1870, dealt with the specific heats of gases. It was followed a few years later by a paper on the thermal conductivity of crystals. Among other problems he studied were the electrical and other characteristics of quartz, the influence of pressure on the refractive indices of various fluids, modification of the planes of polarized light by electromagnetic influences, variations in the functions of the temperature and compressibility of water and other fluids, spreading of oil drops on water. Röntgen's name is, however, chiefly associated with his discovery of the X-rays. In 1895 he was studying the passage of an electric current through a gas of extremely low pressure. Previous work in this field carried out by J. Plucker (1801-1868), J. W. Hittorf (1824-1914), C. F. Varley (1828-1883), E. Goldstein (1850-1931), Sir William Crookes (1832-1919), H. Hertz (1857-1894) and Ph. von Lenard (1862-1947) had made the properties of cathode rays well known. Röntgen's work on cathode rays led him to the discovery of a new and different kind of rays. On the evening of November 8, 1895, he found that if the discharge tube was enclosed in a sealed, thick black carton to exclude all light, and if he worked in a dark room, a paper plate covered on one side with barium platinocyanide placed in the path of the rays became fluorescent even when it was as far as two metres from the discharge tube. During subsequent experiments he found that objects of different thicknesses interposed in the path of the rays showed variable transparency to them when recorded on a photographic plate. When placed his wife's hand in the path of the rays over a photographic plate, he found the developed plate showed the shadows thrown by the bones of her hand and that of a ring she was wearing, surrounded by the penumbra of the flesh, which was more permeable to the rays and therefore gave a fainter shadow. This was the first "röntgenogram" ever taken. In further experiments, Röntgen showed that the new rays were produced by the impact of cathode rays on a material object. Because their nature was then unknown, he gave them the name X-rays.